There is also a whole offering of installation solutions, fixings and finishings to get the most from your Millboard. With Millboard being rot-free and weather resistant, it’s important that the foundations it’s laid on can also provide the same quality and guarantee. Plas-Pro solutions are the ideal companion for Millboard. Made from 100% recycled plastic, plas-pro won’t split, crack or rot like a standard timber frame. This also makes it ideal around damp areas – such as jetties, roof terraces and boardwalks. The marriage of Millboard and plas-pro solutions provides you with a high-performance, low-maintenance outdoor space. With a rise in the number of modern apartment blocks being constructed, balconies and roof terraces now come as standard. The Millboard pedestals are an ideal solution for raised decks and balconies, creating space and breathability to help prevent joists from rot. The smart design of the adjustable pedestals also provides space needed under decks for any pipe work or services to be laid. The pedestals give you control over deck height and are available in incremental adjustable sizes from 300 to 600mm tall. Millboard joist cradles are suitable for all hard surfaces and also provide an acoustic benefit by helping to reduce sound transfer. Like the pedestals, the joist cradles are also adjustable. Say goodbye to unsightly screws in beautiful decking work. 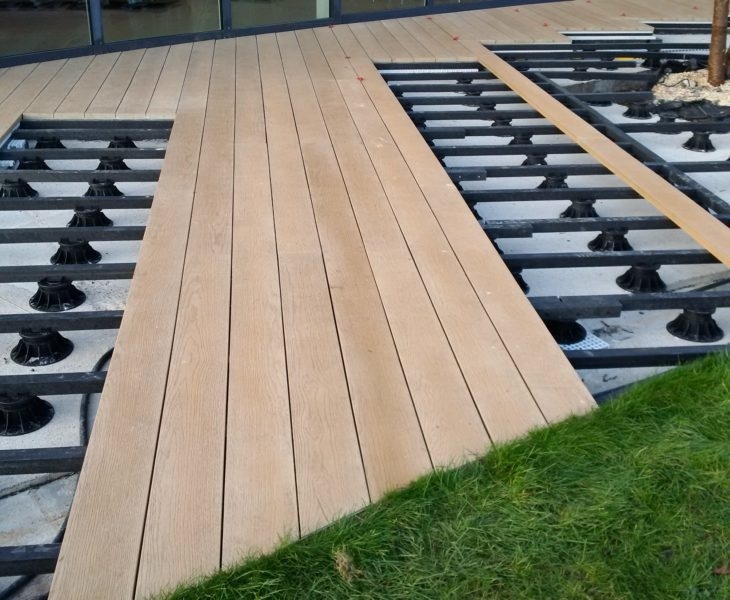 With no pre-drilling needed, Millboard have made installation easy with their Durafix fixings. The stainless-steel screws have a self-cutting tip and simply need to be screwed in. The Lastane coating on the board then cleverly, and simply, flexes over the fixing, leaving virtually no trace of the screw. Creating clean, high-quality outdoor spaces has never been easier. Each board approximately requires 22 fixings and drill bits are included. 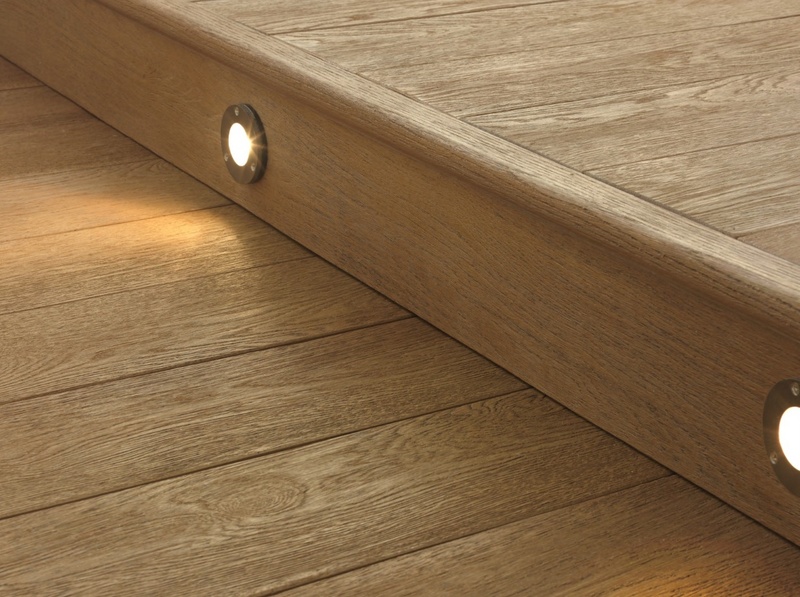 Millboard pay attention to detail and offer a range of fascias and edging to complete the Millboard look. Edging is available in Bullnose for a smooth and subtle look or Ribbed for a squarer look. The Millboard fascias are available to match every decking colour, allowing the space to flow and creating a finished look. Fascias are perfect for those installing multi-level decking or steps. Both the edging and fascias are available as a standard, ridged product or with flexibility to fit curves and contours. Want to find out more about Millboard? Millboard offers a full range of timber-decking alternatives to transform your outdoor space, making it low-maintenance and anti-rot. To download the full technical installation guide, click here. Want to speak to someone about Millboard? Contact us using the form on the right, head into your local branch or pop into our Bishop's Waltham, Ringwood or Romsey branch to see the product itself.